An advertising injury case from Posner, with a bonus picture from the underlying dispute … and it’s not even my birthday. Mead Johnson bought a CGL policy from National Union, with a $2 million limit for personal/advertising injury, and an excess liability policy from Lexington with a $25 million limit (both are subsidiaries of AIG). Both policies required notice of any claim or occurrence “as soon as practicable”; the excess liability policy required notice only if a claim or suit was “reasonably likely” to trigger damages of more than $2 million. The notice provisions entitle insurers to control the insured’s defense, subject to their fiduciary duty to the insured. Mead Johnson said that its Director of Risk Management didn’t learn of the PBM lawsuit until the trial ended, which would be required for its duty of providing notice to kick in for “occurrences,” per an amendment to the agreement. The court found it hard to believe that the Director of Risk Management didn’t know, and anyway a lawsuit was a suit, not an “occurrence.” Posner understood why insureds wouldn’t want their duty of notice to kick in for any trivial “occurrence,” e.g., “baby cried after swallowing Enfamil; crack appeared in Enfamil container.” “But it would be absurd to allow a company served with a summons and complaint or other legal claim to obtain an indefinite extension of its duty of notice simply by hiding the claim from its Director of Risk Management,” especially for a claim of this size (PBM asked for $500 million in damages) by a competitor who’d gotten more than $46 million from Mead Johnson in settling two previous similar suits. Mead Johnson delayed inexcusably in informing both insurers. However, this failure allowed the insurers to disclaim coverage only if they were prejudiced by the late notice. Late notice creates a presumption of harm, shifting the burden to the insured to show some evidence, but probably doesn’t shift the burden of persuasion. Lexington’s situation differed: “Conceivably if placed in control of the defense it could have bargained to a settlement of less than $13.5 million or, failing that, have presented evidence or argument that would have convinced the jury to award PBM less.” But the insurers’ joint defense made no real argument about this, treating Lexington “as the tail to National Union’s kite,” perhaps because of their shared parent. So the insurers hadn’t shown that it would have made any difference if they, rather than Mead Johnson, had hired the same law firm, but also Mead Johnson had only offered the bare facts that the firm was the same and that $13.5 million was less than $41.5 million, one of the previous settlement amounts. And the district court erred by holding that when untimely notice is given by an insured after trial in the underlying suit, the presumption of harm became irrebuttable. The district court should have said that later notice makes it harder to rebut the presumption of harm, but the presumption is never irrebuttable. So, remand. 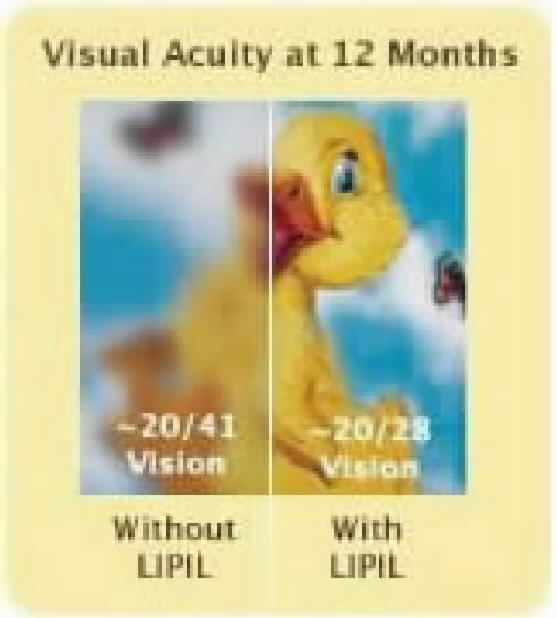 Suppose that a mother who has been feeding her baby a store-brand infant formula made by PBM reads Mead Johnson’s ad which states that “mothers who buy store brand infant formula to save baby expenses are cutting back on nutrition compared to Enfamil,” or, worse, sees Mead’s visual-acuity ad, reproduced below, that tells mom that if fed Enfamil her baby will see an adorable rubber ducky with butterflies, while if fed a store brand, baby will be able to make out only a blurry yellow monster chased by bats. Mom, fearing that she has done irrevocable harm to her precious child, has a nervous breakdown precipitated by Mead’s false, alarmist advertising. If she sues Mead Johnson for infliction of emotional distress, can Mead require National Union to defend and indemnify it on the ground that the mother’s nervous breakdown arose from product disparagement? An affirmative answer—the answer implied by Mead Johnson’s argument—would, by expanding coverage to remote consequences, make it very difficult for an insurer to estimate liability and thus fix a premium for injuries caused by product disparagement. RT: Except that the consequences at issue in the actual consumer protection claim are not at all remote. They are, indeed, the very consequences that the disparagement aimed at: consumers would buy more from Mead Johnson and less from house brands like PBM, enriching Mead Johnson and causing damages to PBM. If the damages to PBM were proximately caused by the disparagement, so too were the damages to consumers. In conclusion, the court cautioned that the underlying tort claim didn’t need to use the magic word disparagement to trigger coverage, as long as the claim fit the legal definition thereof. This entry was posted in damages, disparagement, http://schemas.google.com/blogger/2008/kind#post, insurance. Bookmark the permalink.